Osso bucco is an Italian (Milan) specialty of slow-cooked veal shanks in braised veggies. It is beyond easy and you can cook a lot of it in one go :) It's like a comfort food on crack - addicting and damn good! For the polenta, heat the water till simmering and stir in cornmeal in a steady stream while constantly stirring until fully incorporated. Once it has thickened add all the remaining ingredients in one go and stir till smooth. Pour the polenta into a pre-buttered pan and put in the fridge for about 1 hour (until set solid). For the osso bucco, begin by taking all the veg and sautéing slowly until it has all sweated down and is slightly soft and translucent (about 5-8 minutes over medium heat). Add the vegemite and pepper and mix until the vegemite is melted and thoroughly coats all the veg then pour it out into the bottom of a handy casserole or baking pan. Next, melt the butter in the canola oil and put on high. Take the flour, smoked paprika, salt, and white pepper and mix together. Dredge the osso bucco in the flour to well coated and put in the frying pan until well browned on both sides. After browning all the osso bucco, lay them down on top of the veg in the casserole. Next, add the tomato, beef broth, and thyme to the pan previously occupied by the osso bucco. Combine and simmer for 5 minutes and then pour over the top of the osso bucco in the casserole. Add the whole cloves of garlic and cover the casserole, placing it in a 200C (400F) oven for 2 hours (maybe 2h15m). 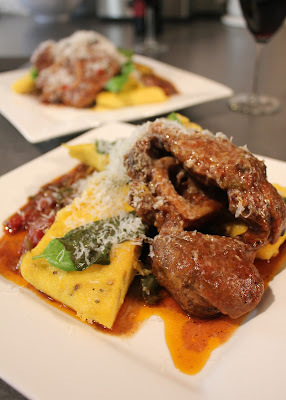 Once your osso bucco is done, take it out of the oven and let it cool (covered) while preparing the polenta. Slice the polenta into whatever shape will suit your plating style. Heat a pan with some canola oil and bacon grease on high heat and place the polenta slices inside and fry till crispy. Spoon the veg reduction onto the plate, place the polenta on top (with some fresh basil), and top with a slice of the osso bucco. Grate on some fresh parmesan and serve with a glass of good Cabernet.